In 2012 the JCMF was awarded to Duc Le (M.S. Arch Woodbury University) to partially fund his installation of the Sun-Bedazzler. 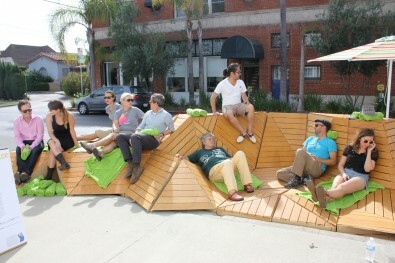 In fulfillment of his graduate thesis project, he re-imagined the parking spot as a sun-drenched oasis. In the newfound tradition of parklets—the micro parks that incrementally take back the street for leisure — the temporary Sun-Bedazzler reprogramed surface parking through the introduction of architecture as an extension of surface. His bold design made the case for a small, incremental approach that has big, long-lasting impact on the built environment.